In the 2016 presidential election, attacks on candidates are becoming increasingly vitriolic. Case in point — the incessant attention devoted to the release of Democratic candidate Hillary Clinton’s past emails. Clinton’s use of a personal email account while she was Secretary of State was acknowledged last March, and seven months later, it is still a recurring story used to undermine her campaign. A key difference between Clinton’s controversy and others’ is that her actions do not affect present national security or policy. Throughout the entire process, she has been fairly transparent about the emails and her mistakes. More importantly, her use of a personal email to send work-related emails was completely legal. Though many like to draw parallels between Hillary Clinton and the scandals of her husband and former President Bill Clinton, the email server stands in stark contrast to Bill Clinton’s actions during the Monica Lewinsky scandal. Not only was his deposition that denied the affair illegal, but he also tried to cover it up by telling a blatant lie that again denied having sexual relations with Lewinsky. Unlike the controversy over Trump’s statements about Mexico, Clinton did not make harsh accusations and defend them. Both Bill Clinton and Trump invited criticism. Bill Clinton was dishonest and committed perjury while in office, and Trump’s policy statements are fair game in a presidential campaign. Yet Clinton’s critics’ continual focus on the email controversy draws attention away from her policies and shifts the rhetoric to a personal attack. It has clearly been a huge campaign issue — Clinton’s own website includes a page explaining the emails as a way of setting the record straight. Similar issues have driven presidential politics in the past. Opponents consistently target specific, tangentially related blunders to smear a candidate’s name. The media, lured by the profits of sensational press, help to publicize the stories further. And people, already biased against a candidate, use the issues as reasoning to explain their dislike of a presidential hopeful. A vicious cycle results, driven by the media and fueled by public opinion, that ends up making people aware not of candidates’ ideological stances, but, in Clinton’s case, of an email controversy that never warranted such outcry. Changing the media’s political coverage would be extremely difficult. As long as people are willing to read sensational news, tabloids and blogs will publish it. Yet we can demand popular reporting based on important issues that keeps coverage of scandals limited to illegal or dangerous ones. We can select what we read and what we discuss. 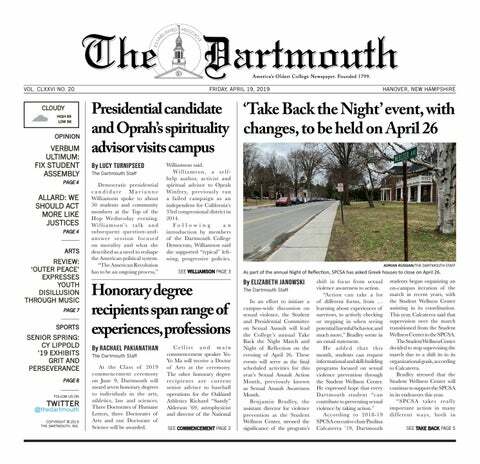 At Dartmouth, we are in an environment that enables discussion about actual issues, not just sensational press. We need to take politics into our own hands and consciously engage with the policy issues that distinguish the candidates instead of controversies that should have died down months ago.